« From $799,900! Burke Mountain Coquitlam MILLARD PARK ESTATES Single Family Homes for Sale between 3641 to 3657 Square Feet! 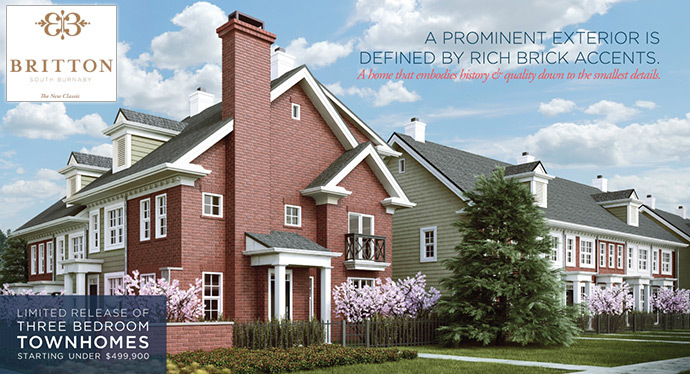 Designed in a great way to reflect the spirit of a traditional English rowhome, the new South Burnaby Britton Townhomes is a unique and bold development that will give residents not only an amazing location but also the finest finishes on the market. From bold roof lines to elegant detailing in addition to the use of fine red brick, the unique Britton Burnaby townhomes will feature three bedroom floor plans that are spacious and functional. The interiors will be bright and open and the homes will also feature ample green space for outdoor living. The South Burnaby Britton townhomes gives residents easy access to an every expanding array of amenities and shopping in the community too. The homes are ideally located close to top rated schools for all ages, public transit, the Edmonds SkyTrain Station as well as the Burnaby Business District as well. Professionally designed grounds in addition to landscaped yards are other great features here. The new classic. Limited release of 3 bedroom townhomes starting from under $500,00 is coming soon! The Britton Burnaby townhomes are brought to you by South Street Development Group. The historically inspired architecture will bring both timeless design as well as modern living spaces for home buyers who want to live in an exclusive townhouse property. The unique character is defined by bold roof lines as well as red brick finishing. With only 44 unique signature 3 bedroom townhouses for sale, Britton Burnaby demonstrates South Street Development’s commitment to developing and designing bright open living spaces with lots of outdoor living and green space. Couple that with functional and efficient layouts, and you’ve got the best South Burnaby real estate development of 2013. The other project team members include: Integra Architecture Inc (architecture), Noble Construction Management (construction) and id.LAB inc (interior design). Find out more online at www.brittonliving.com today. The homes at South Burnaby Britton project will come with 2 designer selected colour schemes (both a light and dark palette for you to choose). All homes have beautiful Taymor satin chrome door handles, electric baseboard heating throughout, high grade laminate hardwood floors throughout the main floor, 2 inch designer horizontal blinds for added privacy as well as vaulted ceilings in the master bedroom. 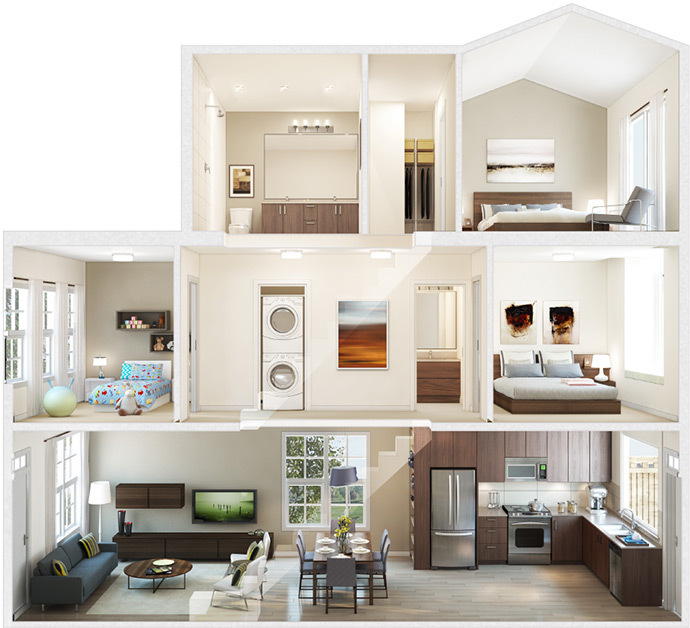 As well, the new Britton Burnaby townhomes for sale will have main floors with 9 foot ceiling heights, privacy doors to the master bedroom, expansive glass windows, outdoor living space and whirlpool stacked front loading washer and dryer. 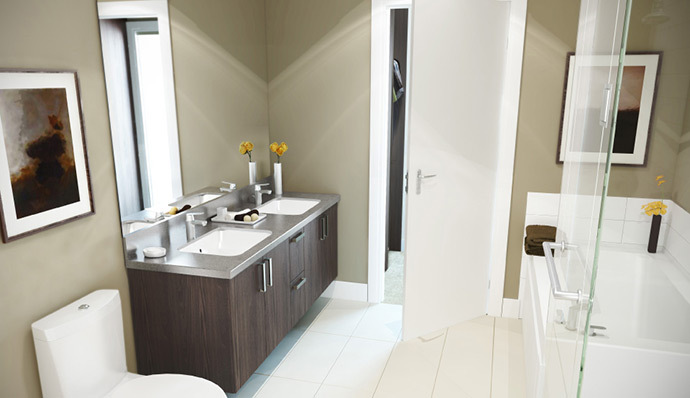 There is an option for a main floor powder room for convenient. As well, the homes at Britton Burnaby will have spa inspired ensuite baths with classic white shaker style or dark flat panel cabinetry with lots of storage in addition to double sinks, modern Grohe fixtures, large format porcelain tiled floors and a deluxe glass enclosed shower and separate deep soaker tub. The designer kitchens have a Whirlpool stainless steel appliance set, open concept kitchen space with pantry storage in select floor plans in addition to built-in floor to ceiling accent shelving (some homes) and designer selected quartz counters. 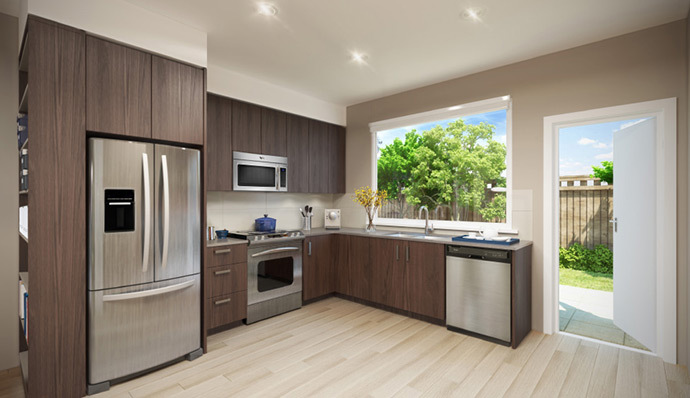 The new Britton Burnaby townhomes also have integrated under cabinetry lighting and the homes have quartz counters with porcelain tiled backsplashes. All home buyers receive a premium warranty through Travelers as well as a 30 year manufacturers warranty on reinforced asphalt shingle roofing with R40 insulation and 50 year manufacturers warranty on durable vinyl siding with shingle accents. The homes also have either double and triple glazed windows and patio doors for energy efficiency. They are also hard wired with in home smoke detectors and have rough in for home security systems. Located in the Edmonds Burnaby neighbourhood, the new Britton Townhouses will offer an exclusive offering of only 44 three bedroom residences. The well thought out and spacious floor plans at Britton Burnaby Edmonds townhomes will range in size between 1,150 to 1,250 square feet (over several floors) and will have bright, open concept modern designs for today’s homebuyers. As well, the main floors will have over height 9 foot ceilings and vaulted ceilings in the master bedrooms, which is an added bonus and not something you see very often. The presale Burnaby Britton Edmonds townhouses will also feature two full bathrooms as well as a rough in for a powder room on the main floor if that is the way you like to go. The interiors will have beautiful stainless steel appliances as well as ensuites with deluxe glass enclosures for the showers (truly modern) and separate deep soaker tub (which is again very rare in today’s townhouse floor plans). In addition, the interior specifications will be sophisticated yet modern and will also include quartz stone counters. The exterior façade has great curb appeal with its traditional brick accents. The South Burnaby Britton Edmonds townhouses for sale will be situated on Kingsway, a major thoroughfare that will whizz you to and from everything in the city. Also, within walking distance from your new home is Edmonds Community Centre, which is brand new and will have facilities and recreational options for people of all ages in addition to the HighGate Shopping Mall. 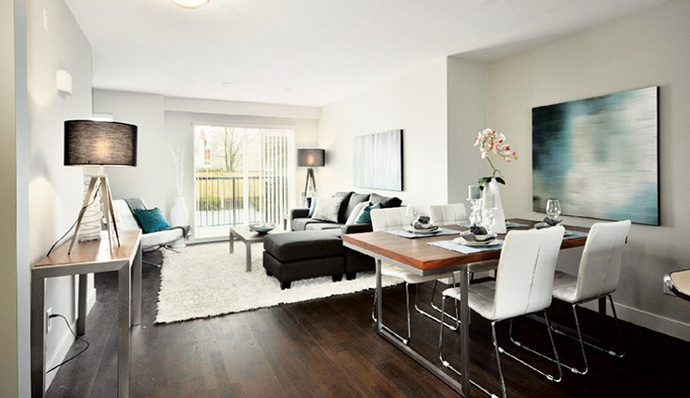 The Edmonds SkyTrain station is literally a 10 minute walk from Britton Burnaby townhomes too. 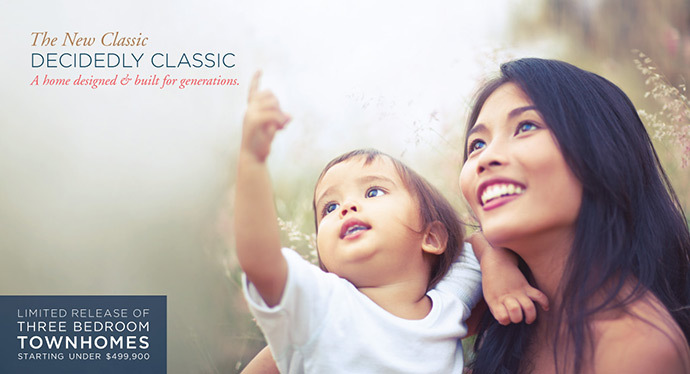 The presale prices start from under $500,000 making the very affordable for today’s families and first time buyers.